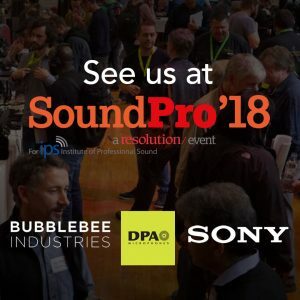 We’re back for SoundPro 2018, where once again we will be exhibiting DPA Microphones, Sony Pro Audio and Bubblebee Industries, together representing an extensive range of professional microphones, wireless systems and accessories. Back at Ealing Town Hall for the fourth year running, SoundPro plays host to the industry’s leading manufacturers, dealers, distributors, and service providers and provides the chance for location recordists, production sound operators, freelancers and audio pros in television, radio, film, post production, live events and game production to get their hands on the latest kit. This year also presents a good opportunity to get up close and personal with some fresh product releases for 2018 including DPA’s brand new 6000 series subminiature microphones, Sony’s Wireless Studio 5 and Bubblebee’s new concealer.